First big test for new Minister of Transportation, Todd Stone: Stanley Park Causeway. At the Monday night Park Board, after hear speakers who mostly spoke in support of Commissioner’s Barnes motion, the majority of Commissioners voted to pass the motion to create safer conditions for people walking and riding bikes on Stanley Park Causeway. The two NPA did not vote in support of the motion. Now, the issue lies with Minister of Transportation, Todd Stone. After his ministry concludes its investigation, will it improve safety conditions on the causeway? Without a doubt the number one priority of the Stanley Park Causeway from the beginning has been to move cars fast. People riding bikes and walking have been literally pushed to the margins. When the Lions Gate Bridge was renovated and the Stanley Park Causeway was widened little serious design attention was placed on creating a safe built environment for bikes and pedestrians. On May 25 at around 7 pm the predictable results happened, a 61 year old women was killed after falling off her bike and was struck by a bus. While the details of the horrible collision are still being investigated what is clear, is that the shared path on the Stanley Park Causeway between people walking and riding bikes is unsafe and needs to be redesigned. One only has to be out there for a little while to see how unsafe the space is with the speed of the cars and bikes in close proximity to people walking. The responsibility for the safety conditions on the causeway is the responsibility of the Provincial government and the new Minister of Transportation, Todd Stone, since the causeway is part of the highway system. The Ministry of Transportation is currently investigating the death on the causeway. 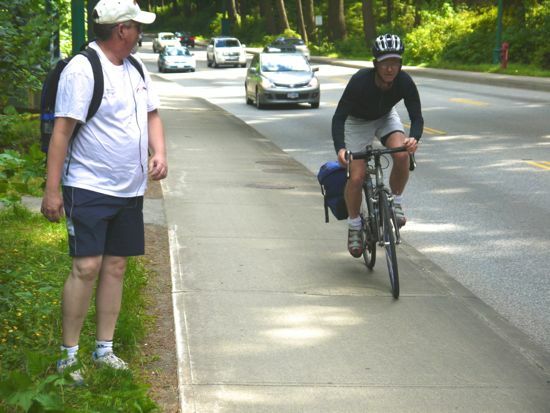 At the Monday June 24th Vancouver Park Board Commissioner Barnes is going to bring forward a motion calling on Park Board staff to work with Ministry of Transportation to create safer conditions for people walking and riding through the causeway. This will be the first big test for Minister Stone. Will he allocated resources to quickly improve conditions for people not in cars? Categorized under: active transportation, Vancouver Park Board. Tagged with: Commissioner Constance Barnes, Lions Gate Bridge, Ministry of Transportation, people riding bikes, people walking, Stanley Park Causeway, Todd Stone.